Wow!! 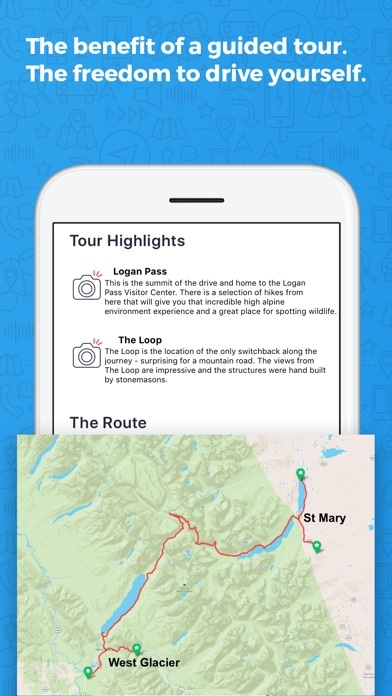 This is the second year we have used GypsyGuide, throughout the Canadian Rockies and Glacier National Park’s GoingToTheSun Highway. It worked flawlessly with smartphone connected by Bluetooth to car’s speaker system. Just like going on a guided tour in your private vehicle. It’s display on your phone gives your exact location and where the next audio point of interest is located. I highly recommend all versions that we used. Just used it today for a round trip from West Glacier. The commentary was easy to understand, informative and well said. 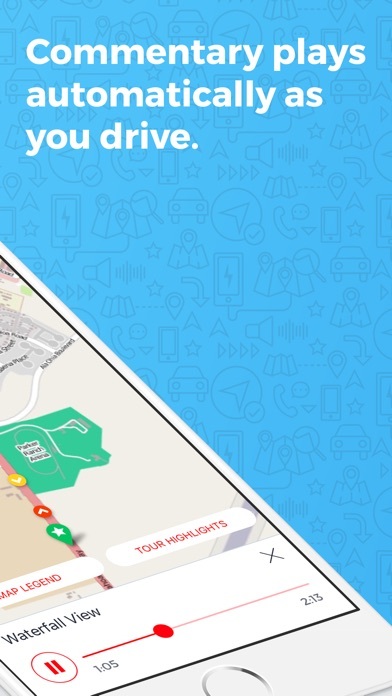 The gps location use allows the app to know where exactly it is and the comments about views, turn offs, parking and hike access are precise and easy to use. On the return we heard the same comments in reverse order with some appropriate differences. Overall, excellent purchase. We just completed our stay at Glacier. We would have been lost with our Gypsy guide. The information we learned and the route guidance was invaluable. This app was very informative. My entire family (kids included) listened intently to the narrator. We would have learned never learned all of the factual information without this app. Loaded and played with before trip, day of trip paired phone with vehicle, got to park...didn't work! No worries...turned off Blue Tooth and phone was plenty loud enough for two to listen to even with a LifeProof case on. Great info. 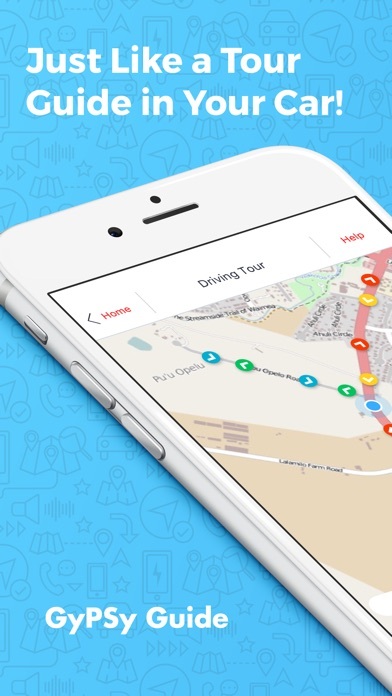 Great app for a reasonable price (and I'm a cheapskate!) Been to the park several times before but it's been a while. There were several awesome places we would not have stopped if we had not been listening! The history lessons were wonderful! And there were a few we stopped that were pretty cool that the audio didn't tell us about. All in all a great trip and a great app. I will def be checking into more of your apps specifically the Yellowstone & Tetons app and The Big Island apps! Any chance you could get a Kauai app ready before early Dec.? Thanks! Things that would make me rate this app higher: 1. 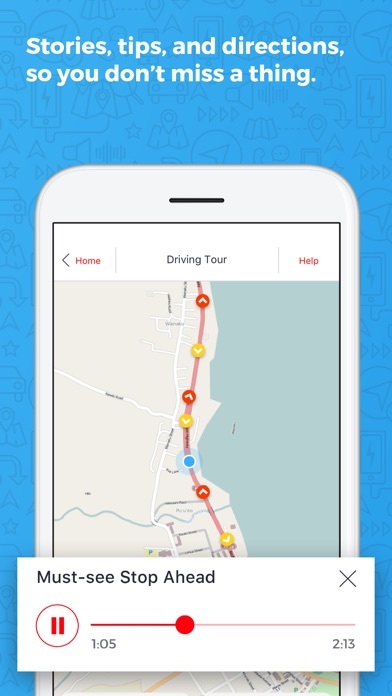 Add narration for the Many Glaciers Road 2. Maybe add that The Stanley Hotel in Estes Park, Colorado is the hotel that actually inspired the book The Shining, that The Ahwahnee Lodge in Yosemite Ntl Park inspired the sets for the interior for the movie production and that Timberline Lodge is the lodge on "side of Mt. Hood" used for exterior shots during the filming. Sorry, nit picky I know, but I'm a history buff. 3. More trail info (round trip or one way distance, altitude gained, difficulty, bathrooms on trail, etc.) A BIG kudos to you for the ones you did point out. 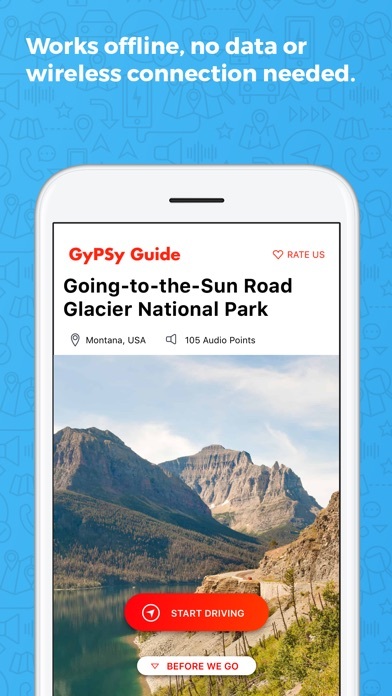 Going to the Sun Road is our 7th Gypsy app and we've loved each one. Besides letting us know where to stop and what to see, the guide, who after all our adventures feels like a friend, provides a comprehensive understanding of the history and geography of the area. Can't wait to see where he'll take us next! We loved this app. It gave us so much more information than we would ever have known. We drive the road two round trips and listened all the time because we picked up things we missed. I felt sorry for the others passing us by because they didn't know to stop. Love this app! A fantastic companion to a beautiful drive. Made the drive come alive. Well narrated, with interesting stories about the park and road. And technically, the gps integration was excellent. I only wish they had more areas. Perfect for those who want to drive thru and understand what you are looking at and the history notes - very informative!